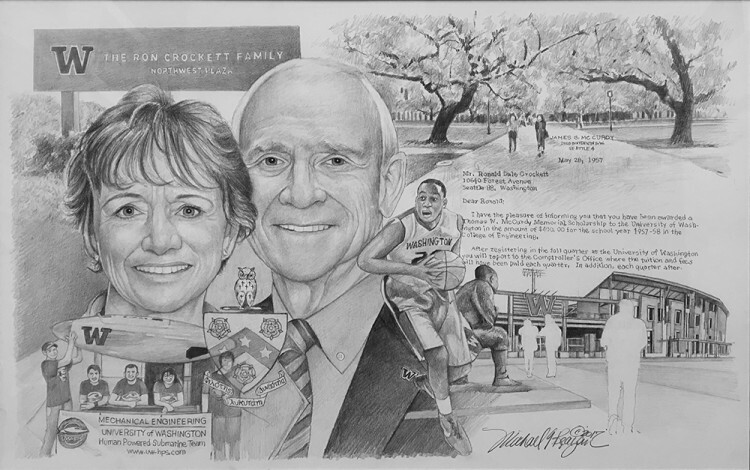 Sixty years ago, Ron Crockett received a scholarship that changed his life. Now he and his wife, Wanda, have been honored with the Gates Volunteer Service Award for their commitment to changing the lives of others. Ron Crockett carries a letter in his briefcase wherever he goes. Dated May 28, 1957, it came from James G. McCurdy, informing Ron that he had received a scholarship to attend the University of Washington. For the son of a mechanic and a riveter in Renton, the Thomas W. McCurdy Memorial Scholarship was an essential link to higher education. Ron recalls going to Jim McCurdy’s office on Harbor Island after receiving the scholarship, which was named for McCurdy’s late brother. “He looked me in the eyes and said, ‘Whenever you get, give back,’” says Ron, who took this advice to heart — and continues to do so six decades later. Ron later found in his wife, Wanda, a partner who shares his love for transformation, whether it’s through growing businesses or cheering on their growing grandchildren. Together, they’ve also focused their generosity on creating positive change at the UW, which they’ve elevated through support for athletics, engineering, business and beyond. In recognition of the indelible mark the Crocketts have left on the University, the UW Foundation has honored them with the 2017 Gates Volunteer Service Award (GVSA). Presented annually, the GVSA recognizes individuals who give generously through both philanthropy and service, not only shaping the trajectory of the UW but also encouraging others to do the same. With the help of the McCurdy Scholarship, Ron earned a degree in mechanical engineering in 1961 and began working at Boeing. Wanda, who moved to Seattle from Othello, Washington, in the late ’60s, joined the company soon after. It wasn’t long before Ron had an idea for a new business — and he invited Wanda to join him. Along with her and three new hires, Ron established the commercial aircraft overhaul facility Air Repair, later named Tramco, in 1970. It eventually grew to 2,500 employees, and when Ron sold it to BFGoodrich in 1988, it was the largest company of its kind in the country. But true to their nature, the Crocketts kept on building. After launching several more businesses, the couple followed a lifelong passion of Ron’s: They brought live horse racing back to western Washington, opening Emerald Downs in 1996. All along the way, the Crocketts heeded Jim McCurdy’s words by giving back — from funding brain tumor research at Seattle Children’s to fostering facilities, programs, scholarships and more across the UW. Renovations of Husky Stadium, Hec Edmundson Pavilion, the Conibear Shellhouse and the Dempsey Indoor Practice Facility bear the stamp of the Crocketts’ support. So do the many student-athletes who train, practice, play and study in those spaces with the help of athletic scholarships the Crocketts have established. Among the many talented recipients of Ron’s guidance is former UW men’s basketball standout Quincy Pondexter, ’10. In a letter of thanks, Pondexter fondly recalled Ron’s unyielding focus on succeeding in school. The Crocketts continue to envision a bright future at the UW. Through their ongoing support, Ron’s service as past chair of the UW Foundation Board and as a member of the Tyee Club Executive Committee, and the couple’s deep belief in the power of education to change lives, they are making that vision a reality. As a legacy of the one scholarship Ron received 60 years ago, he and Wanda have bestowed 277 scholarships so far — and their influence keeps growing exponentially. Together they are creating driven, successful graduates who will pay their generosity forward. A worthy investment indeed — one that continues to transform buildings, programs and, most important, the people they serve. Two weeks after they got married in 1972, Maggie and Doug Walker packed up their car and drove from Greenville, South Carolina, to Seattle. They came for adventure and for school — Doug, for graduate studies in mathematics, and Maggie, for bachelors’ degrees in history and communication. Their student days at the UW were the foundation of a decades-long history of generosity and leadership — a tradition of inspiration, collaboration and transformation across disciplines. In recognition of the Walkers’ tremendous impact, the UW Foundation has honored them with the 2016 Gates Volunteer Service Award, given annually to individuals who demonstrate a deep commitment to the University through their long-term philanthropy and volunteer leadership. True to Maggie’s broad range of interests, she has served on boards across the UW, and on committees for all the University’s major campaigns. She remains deeply involved with numerous schools and colleges, and as a director of the UW Foundation Board. While Doug enjoyed a long, fruitful career at WRQ, a software firm he co-founded, he remained an ardent philanthropist and advocate for access to the outdoors and to education. Tragically, Doug passed away at the beginning of this year. He was a veteran climber with countless summits under his belt. But although he stood atop many mountains, just as important to him were the people he took along with him. Doug’s passion for helping others stretched beyond the trail and into the community, dovetailing with the drive and vision of Maggie. Together, they achieved some of their most impactful work at the University. From their creation of eight endowments in the College of Arts & Sciences to their instrumental leadership role in establishing the College of the Environment, they brought members of the UW community together — and raised it to new heights. It is the University’s impact on the community that has inspired the Grinsteins to be such passionate advocates. In recognition of their deep and long-standing commitment to the University, the UW Foundation has honored them with the 2015 Gates Volunteer Service Award. Jerry, whose remarkable career has spanned politics, law and business, has proved an invaluable UW leader in many capacities. A co-chair of the University’s first campaign and a former UW Regent, he has served — and continues to serve — on a host of UW boards and committees. He and Lyn both bring their passion and leadership to the UW Medicine Campaign Initiatives Committee. Lyn, a former chair and current director of the UW Foundation Board, also leads campaign fundraising efforts for the Institute for Stem Cell and Regenerative Medicine, and she puts her love of the arts to work as a member of the Henry Art Gallery Advisory Council. In her tenure as chair of the UW Foundation Board, Lyn created the Deep Dive program, which gives volunteer leaders the chance to experience the remarkable things that happen across the University every day. 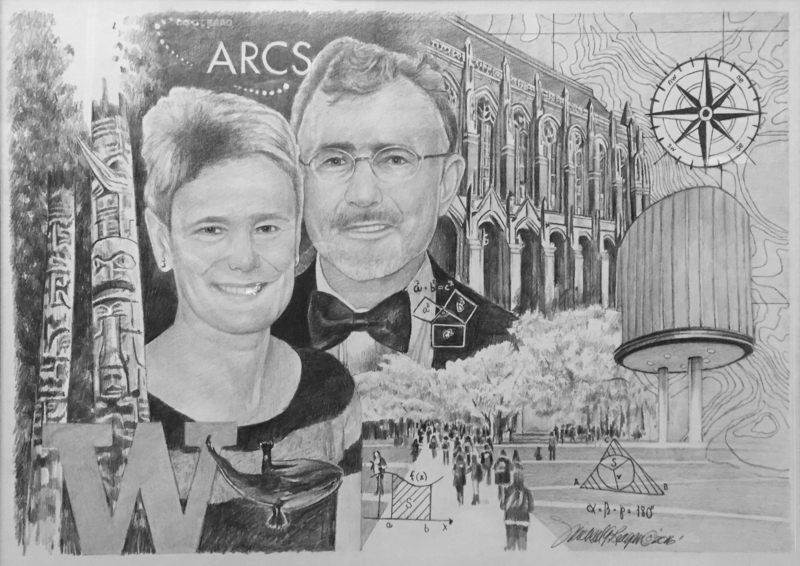 This video is a profile of the Grinsteins and highlights their many contributions over the years to the University of Washington. “The UW launched us,” says Micki Flowers, ’73, who met her future husband, Bob, on campus. Her journalism career, which spanned 31 years at KIRO TV, began at The Daily. Bob, ’65, ’68, credits his long career at Washington Mutual to his studies in the Evans School of Public Affairs. Grateful for the UW’s shaping influence in their lives, these Husky sweethearts have since transformed it through their long-term leadership and advocacy. In recognition of their profound impact, the UW Foundation has honored Micki and Bob with the 2014 Gates Volunteer Service Award. The couple devotes tremendous time, talent and energy to programs ranging from Husky sports to the Department of Communication. Fervent champions of graduate education, they have established several fellowships, including an endowment for the ARCS (Achievement Rewards for College Scientists) Foundation. Jeffrey, ’64, ’67, and Susan Brotman’s hard work on behalf of the University of Washington reflects a deeply personal commitment to helping Huskies. Many nights, Susan burns the midnight oil reviewing reports or strategizing how to bring more volunteers on board at the UW, while Jeff does the same across the hall. Jeff and Susan have sacrificed things like television, socializing and sleep in favor of giving back. They work hard to make the biggest impact on the community. And their commitment has transformed the University of Washington. Like the time Jeff, co-founder of Costco Wholesale, rallied the community, raising $1 billion as chair of UW Medicine’s portion of Campaign UW: Creating Futures. Or the leadership Susan brought as chair, vice-chair and director of the UW Foundation Board over her 20 years of service. Their shared dedication to service was inherited from their parents. Growing up, both Jeff and Susan were raised with a deep sense of community spirit and sense of civic duty. Jeff’s folks helped out their Tacoma clothing store’s employees, covering their tuition in hard times. Susan’s mom and dad volunteered with the March of Dimes and their community church in Montana, supporting their small town with neighborly care. Influenced by family tradition, the Brotmans have dedicated their lives to helping others, especially underrepresented students who excel academically, but struggle to afford tuition on their own. Jeff and Susan established several scholarships on campus and in 2000, with the help of Costco’s co-founder Jim Sinegal, created the Costco Scholarship Fund. More than a thousand undergraduates at the UW and Seattle University count the Costco Scholarship as a life-changing opportunity to pursue their dreams. With philanthropy in their DNA, Jeff and Susan have supported dreams at the UW and encouraged others to follow in their footsteps. 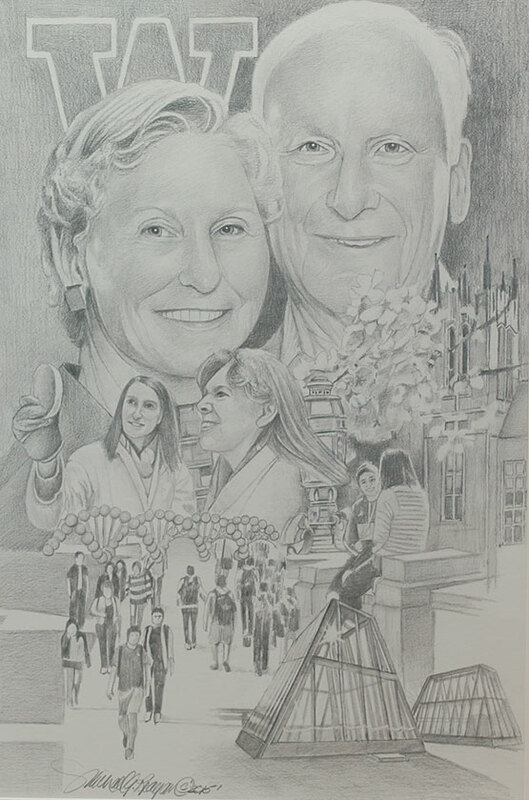 Whether it’s the Law School or the Henry Art Gallery, UW Medicine or the Board of Regents, the Brotmans typify the civic glue that brings philanthropy and education together, touching countless lives along the way. 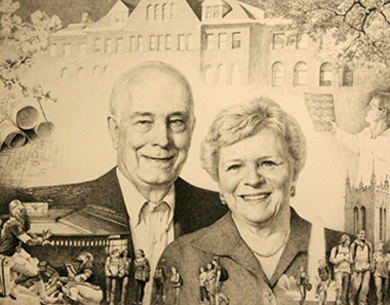 Through their distinguished record of service, leadership and generosity, Dan, ’48, ’49, and Nancy Evans have inspired countless others to follow in their footsteps, sometimes quite literally. With a history of accomplishments on a grand scale, it’s easy to overlook the smaller gestures that Dan and Nancy often make, like the time Dan, at age 81, speed-walked a half-marathon to raise more than $100,000 for student scholarships. Or when both Dan and Nancy laced up their walking shoes to kick off a 50th anniversary run/walk for the Daniel J. Evans School of Public Affairs, attended by more than 300 people last October. 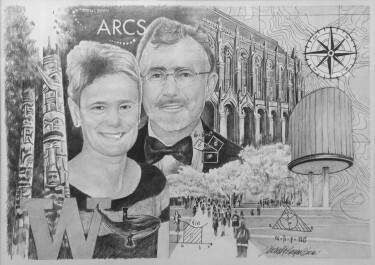 Dan and Nancy have left an indelible mark on the UW and beyond. At the University, they have provided philanthropic support for more than four decades and have held more than a dozen leadership roles. Dan has served two terms on the Board of Regents and as UW Foundation chair. Nancy served on the School of Public Health’s inaugural visiting committee and as honorary chair of the Evans School’s 50th Anniversary Gala. Their thoughtful and collaborative leadership is credited with making big things happen, including the renovation of Husky Stadium and construction of Benaroya Hall. “If they take on an issue, they will follow through until the task is done,” says Judy Runstad ’74, a 2009 recipient of the GVSA with her husband, Jon Runstad ’65. “Dan and Nancy personify this award and what it’s all about, service.” And, in Dan and Nancy’s case, always going the extra mile. At the University of Washington’s Tenth Annual Recognition Gala on September 9, local business and community leaders Mike and Lynn Garvey were named the recipients of the 2011 Gates Volunteer Service Award in recognition of their commitment of sharing their time, expertise and support. 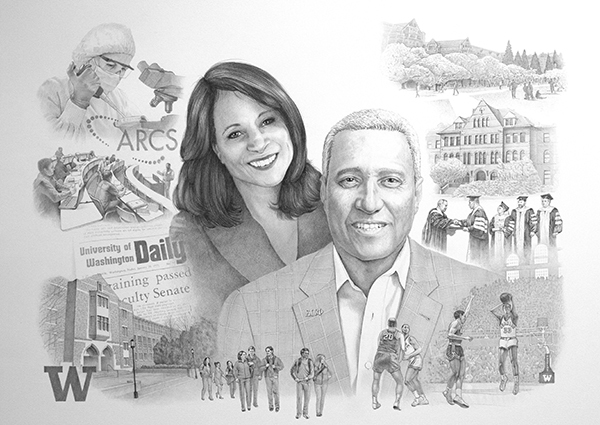 From the Foster School of Business to the Burke Museum, UW Medicine to Law, Arts & Sciences to Athletics, the Garveys have made the UW’s learning and research efforts stronger. They’ve also served in leadership positions on numerous UW boards and committees. After earning math and law degrees at the UW, Mike taught courses at the business school in the 1970s while getting his own law firm started. Since then, Mike has mentored and taught undergraduate, MBA and doctoral students at the Foster School and the law school. Lynn, who also attended the UW, has spent decades volunteering for the Arboretum and cheering on her beloved Huskies. Inspired to support research aimed at curing and preventing diseases after losing her sister to cancer, Lynn extended their generosity further by funding the Garvey Cell Imaging Lab and medical research. They also honored the memory of friend and business partner Bob McMillen by making a lead gift that created a professorship in his name. Whether it’s students, faculty or community members, few can help but be inspired — including other University friends. “Mike and Lynn’s selfless approach to giving back and working with others is highly compelling and in fact, highly contagious,” said colleague and fellow Foster School volunteer Michael Mondello, president and CEO of SeaBear. Bob (‘43) and Sally (‘44) Behnke and John F. (‘50) Behnke have dedicated countless hours serving the University of Washington and strengthening the relationships and connections between the University and its many supporters. Bob and Sally’s long-standing support has impacted numerous areas of the UW, including: the Henry Art Gallery, UW Medicine, Husky Athletics, the Presidents Fund, the Graduate School, Student Life, UW Alumni Association and more. In 1990, Bob and Sally were awarded the first UWAA Distinguished Service Award in recognition of their true Husky Commitment. John Behnke, Bob’s brother and a longtime community leader, shared the Behnke family devotion to the UW and carved his own legacy of support. Not only was he an ardent supporter of Husky football, John volunteered across the University and was himself a recipient of the UW Alumni Association Distinguished Service Award in 2005 for 30 years of service to the University, including chairing its first annual fund drive in the late 1960s. John also was instrumental in implementing non-discrimination policies in all alumni activities. Building on a multi-generational affiliation with the University, former UW Regent Jon Runstad (’65) and his wife, Judy (’74), have championed the advancement of real estate education in the College of Built Environments, generously supported the School of Law and provided undying support to the rowing program at the University. Additionally, they’ve dedicated countless hours to serving on or leading several UW committees and boards, making important connections among those who support the UW. Artie Buerk, ’58, graduated from the University of Washington nearly five decades ago, but he never really left; he has dedicated countless hours to serving on or leading UW committees and boards and making important connections among those who support the UW. Buerk is the advisory board chairman of the Michael G. Foster School of Business and an advisory board member of the Information School. He is past president of the UW Alumni Association and a former director of the UW Foundation. Moments after Buster and Nancy Alvord received the Gates Volunteer Service Award at the Fifth Annual Recognition Gala Sept. 8, the couple made a surprise announcement that they will help create a Center of Excellence for Neuro-oncology at the University by establishing six new endowed faculty chairs with their family. This commitment continues the Alvords’ long legacy of dedication to the University of Washington, particularly to UW Medicine, where the Alvords serve as members of UW Medicine’s Campaign Cabinet. In addition, Buster serves on the Neurological Surgery Committee. Nancy was a founding director of the UW Foundation and has been a member of the UW Libraries Visiting Committee and the History Visiting Committee. “Buster and Nancy have come to philanthropy and public service quite naturally,” said UW President Mark A. Emmert. 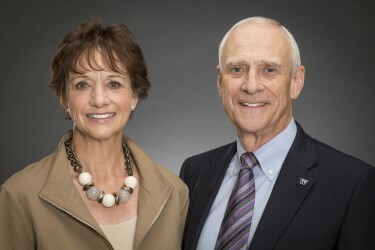 “It’s an obvious outgrowth of what they were taught by their parents and they in turn have taught it to their children and grandchildren.” The Alvords and their family, which includes 13 UW Benefactors, have collaborated to create two endowed chairs in Neuropathology and the Harborview Mission of Caring Endowed Fund for Uncompensated Care. They have made many other generous contributions to the UW. Two of the University’s “quiet leaders,” Anne (’55) and Wayne (’55, ’57) Gittinger, took an unaccustomed moment in the spotlight recently when they were honored with the 2005 Gates Volunteer Service Award. “These people are the epitome of volunteer service,” said friend Ron Crockett, a sentiment reinforced by Connie Kravas, the UW’s vice president for development and alumni relations. “Having people like Anne and Wayne behind you is like having the strongest wind in your sails,” she said. In addition to their support for athletics and a broad range of UW programs, the Gittingers also have been longtime supporters of the School of Law, where Wayne earned his juris doctor. Their leadership contributed greatly to the success of the Campaign for William H. Gates Hall, and Wayne serves on the school’s Visiting Committee and Dean’s Advisory Board, among other volunteer activities. Don Petersen began volunteering at the UW in 1979. As National Chair of the Annual Giving Campaign, he created the President’s Fund for Excellence, a University-wide source of discretionary support, and oversaw the quadrupling of private support to the UW. In 1987, he co-chaired the Campaign for Washington with John Nordstrom and Gerald Grinstein. Petersen became a founding director and first chair of the UW Foundation when it was established in 1988 and continued supporting the UW Foundation throughout Campaign UW: Creating Futures and as a generous donor whose giving has supported faculty, students, various University programs, and the UW campus. Herman served as a UW Regent from 1983 through 1985, and was the first chair of the School of Medicine’s fundraising campaign during the Campaign for Washington in the 1990s. He and Faye have hosted events on the University’s behalf and both have inspired many private contributions to UW programs. 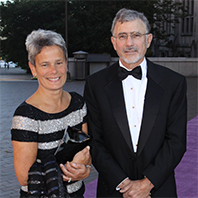 “As leaders, Herman and Faye recognized that others would follow if they led by example, which they have always done, and they led by the example of establishing the Sarkowsky Chair in Pediatric Neurology,” said UW Medicine Dean Paul Ramsey. Hunter (’49) and Dottie (’82) Simpson, through their outstanding contributions to the University of Washington over the past five decades, have demonstrated extraordinary willingness to volunteer time and assets for the betterment of the UW community. Their financial gifts to athletics, nursing, medicine, and the new law school have enabled the University to maintain its tradition of excellence and provide students with the resources they need to achieve their highest potential. Hunter’s leadership as a UW Regent, founding director of the UW Foundation Board, and past president of the UW Alumni Association, and Dottie’s service on the School of Drama Visiting Committee, the Tyee Board, and the local and national chapters of Achievement Rewards for College Scientists (ARCS) have had a tremendous impact on the UW.